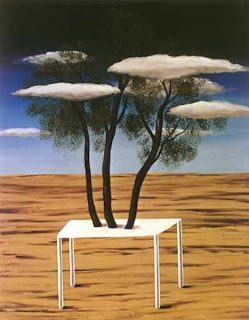 This is another painting by surrealist Rene Magritte called "The Oasis" done between 1925-1927. I looked up the meanings to this painting and I dont really understand it. Reviews say that surrealists experience some sort of "Yggdrasil" and psychological experiences, and thats why he painted the 3 trees that represent Druid. He apparently saw God as being a woman in the Earth. This painting is unique, I just dont understand the meaning of it. I dont get why there are trees comming out of a table.